I got my R2 on Black Friday, and I just got done putting it together a week or 2 ago. I plugged in the USB and flashed Marlin with no issues. Then plugged the printer into main power, and had three or four small issues that i have worked through with almost no trouble. When the printer is on only USB or wall power the display reads correctly for the hotend 20ish degrees. Then when power from both wall and USB power the displays reads in the neighborhood of 350ish degrees. Any ideas on what could cause this? This is before powering the hotend up, which I haven't done yet. I am new here. I came across your previous comment about the high extruder 1 temperature of 358 degrees. I seem to be having a similar issue. Did you ever find out what was causing it?? That is almost certainly an open circuit thermistor. Either a bad connection somewhere between the board and the hotend, or a bad thermistor. I tried to do a bit of reading to find out possible solutions. So far my sanity checks are below. I haven't sourced the issue yet. I am not electrically minded but have some experience. This is my first time usign a forum like this so I am not sure how much information is required. So I will try to be thorough. History: First time I switched on the power supply, it fried itself (wired as per the latest manual). I assume it was a dudd from the factory. I replaced it with a "Meanwell RSP-500-24" power supply. Both thermocouples (TC's) not registering a temperature. Bed temperature shown as 40--45C on Repetier. Extruder 1 Temperature showing as 357.5C. Throughout my testing neither of the values have changed on the LCD or on the manual control view on repetier. The bed did heat up a little before triggering a High Temp error. The extruder has never heated up but has triggered errors for not reaching temperature after a set time. Resistance measured at approximately 100 ohms for each TC. Wires removed & checked for breaks or shorts (visually).Then multimeter continuity test. All seems ok.
Held the tip of the TC's between my fingers and the resistance of both dropped as expected. Switched the connections around on the board to see if that would change anything. Still no response from the TC's. I even tried applying a little (light) pressure to the connector in case it had come loose from the board. No change in the temperatures shown. Continuity test on the 2 pin connections where the TC's attach to the board. all still ok. No power from USB or Mains. i.e. no beep when the multimeter probes are touching each of the 2 pins. The TC is connected during this. Continuity test when USB plugged in. All still ok. No beep across the 2 pins. The TC is connected during this. Continuity test when USB & Mains power on Failed. BEEP. Now I am confused. Why would this be the case? 3. No visible shoddy soldering or loose metal fibers bridging any connections. 4. Board cleaned with compressed air to make sure. I also checked all of the wiring/connections. Checked the wire loom for breakages and the power supply for shorts or loose connections. I also checked the heated bed and the cartridge heater for the extruder. These both beep when I check continuity which I assume is correct as they are basically just a large resistance that will heat up? I am stumped. Any ideas on where to go now would be really appreciated. Re-flash firmware with bone stock FT5 R2 firmware. If that doesn't work and your resistance readings are correct, your board is probably toast. I am going to do a little more investigating and follow the steps you recommended. Just in case, I have ordered a replacement board and a few thermistors. Also that was a typo. Should have been 100kohm. Looks like I have her fired up and running. @carefudundae you were right. It was an open circuit thermistor after all. On the bright side, now I have spares! I did replace the board and re-flashed the stock firmware on advice of @Wyvern as a precaution before finding the open circuit thermistor. I do think the board might still work but no point switching back now that shes up and running. Glad to hear you are back in the printing game! Its good to be back. Now on to the fun of getting everything calibrated properly. I am hoping to contribute a bit here once I get a bit more familiar. I have started tweaking the stepper drivers and monitoring with a multimeter. I also tried calibrating the extruder by marking 100mm of filament, extruding, checking how much was actually extruded, making corrections to the firmware to adjust the feedrate. There is still a way to go as you might see from the image. 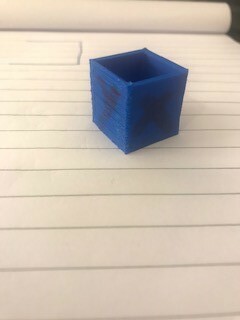 Any thoughts on what is causing the rough ridges on the left "Y" axis side of the calibration cube. I have checked the leveling and tweaking the stepper drivers. So far no real difference in quality. Is it possibly an over extrusion issue? Print a larger block. And show your G code file. Could be an issue with Prime, over extrusion or slicer files.